We continued our discussion of animals in the winter. We went on to discuss the different types of animals that hibernate; bears, skunks, snakes, frogs, groundhogs, etc. Why do these animals hibernate? When will they wake up? Our resident hibernating expert had all the answers for us. Thanks little guy! So today we made a hibernating bear. This was the first year I have ever done this activity. It's a little messy, but hey that's more fun right? First I gave each child a styrofoam cup. I used a large cup because I thought the bear was too big for a regular sized cup. I'm pretty sure you can get away with a regular sized cup. 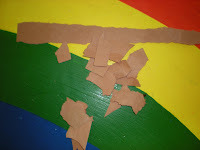 I then gave the children some strips of brown paper and asked them to rip them into pieces to cover the outside of the cup, to make it like a cave. Their ripping skills are still emerging, they would rather pull apart--which doesn't work too well. 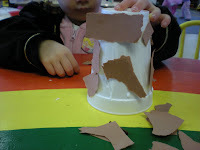 We then covered the cups with tacky and the children put their ripped pieces of paper all over the cup. Next all the children got a bear cut-out which I had ready for them. I also had cut brown yarn into pieces so we could give our bears fur. 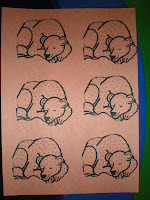 The children put the glue on the bears and covered the glue with the yarn. Finally we took a large tongue depressor, to use to make our bear go in and out of the cave. I pushed the tongue depressor through the bottom of the cup, then took it out. We then glued our bear to one end of the tongue depressor. The other end went through the slit I made on the bottom of the cup. Then we could use the stick to put out bear in and out of the cave. I thought they turned out pretty neat. We read the story "When Will it Be Spring," by Catherine Walters . This is a cute story of a baby bear and his mom hibernating for the winter and Alfie, the baby bear keeps waking mom up to ask it it is spring yet. I also love the book "Bear Snores On." by Karma Wilson, illustrated by Jane Chapman. I have this one at home and read it alot, I love all the "Bear" books. Bear is sleeping in his cave and some other little animals come to take refuge in the cave. Do they wake bear? 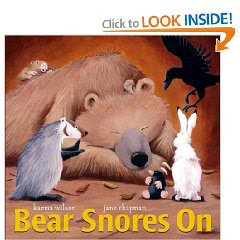 I love the story "Bear Snores On". Perfect for this time of year! This morning I wanted to be like the bear, but had to get out from the warm bed! Cute craft! I'm sure the kids enjoyed it and now they have something to take home to play with and use their imaginations! 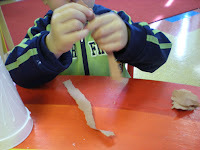 Hi Trish, we added this activity to our letter B post, scheduled for tomorrow. Thanks for another great idea!